Beshbarmak looks like something a nomadic horseman would eat: wide pasta topped with big hunks of meat and onion. It doesn’t look particularly appetizing. But believe me when I say it is something special. 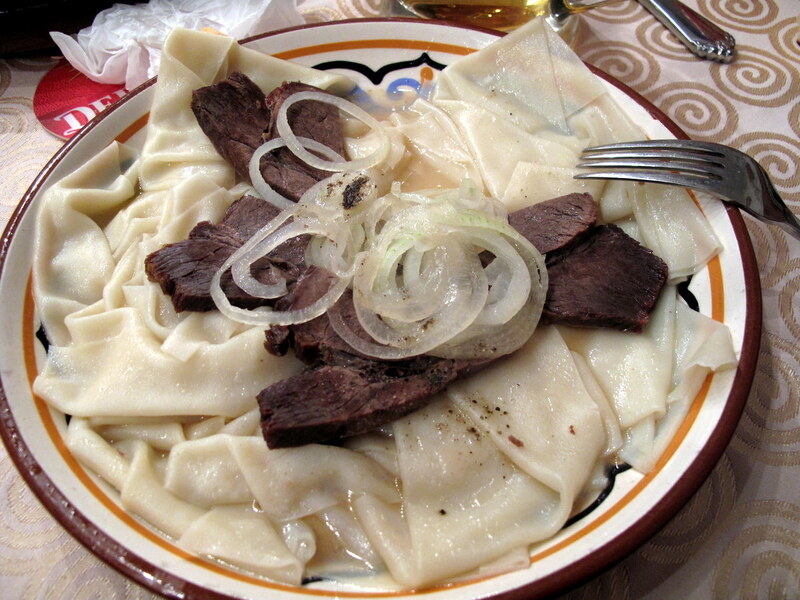 Beshbarmak as served in Kazakhstan. Photo from Wikimedia Commons. Beshbarmak literally means “five fingers” due to the way it used to be eaten. 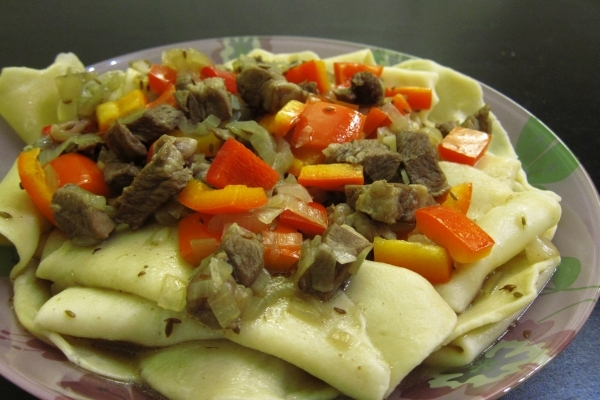 It originates from the nomadic peoples of Central Asia, and nowadays this type of dish is enjoyed all across the region: as beshbarmak by the Kazakhs, Kygryz, Tatars, and Bashkirs, as turama or dograma in Karakalpakstan and Turkmenistan, and naryn by the Uyghurs. 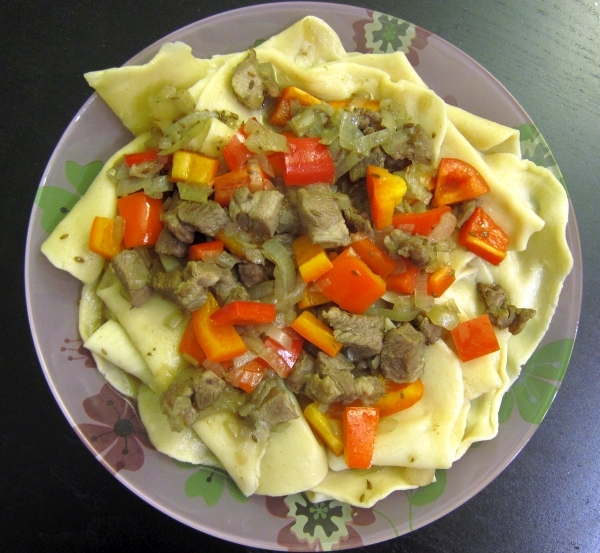 Truly a pan-Central Asian dish! 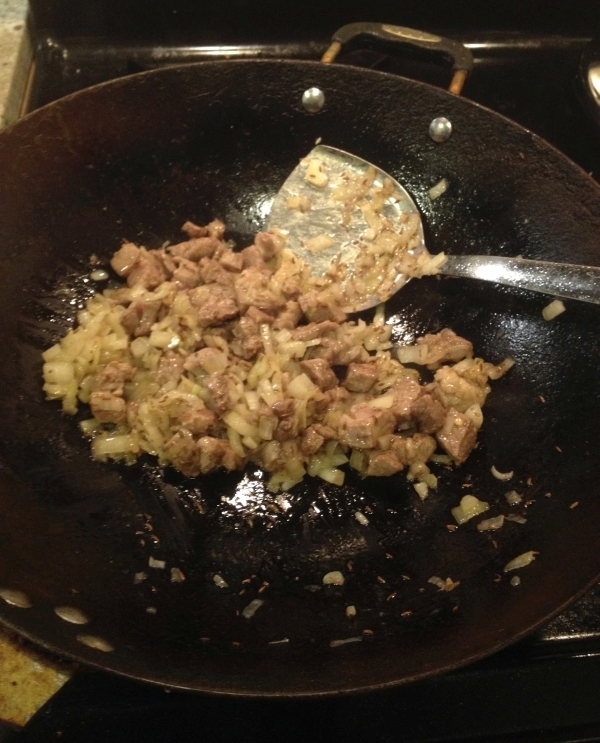 Traditionally, beshbarmak is cooked with all sorts of different lamb and horse meat cuts, as well as kazy (horse meat sausage). I have a hard enough time finding lamb meat here in NYC, so I just used lamb shoulder chops. It would work well with beef, too. My version is a little different from the traditional dish. 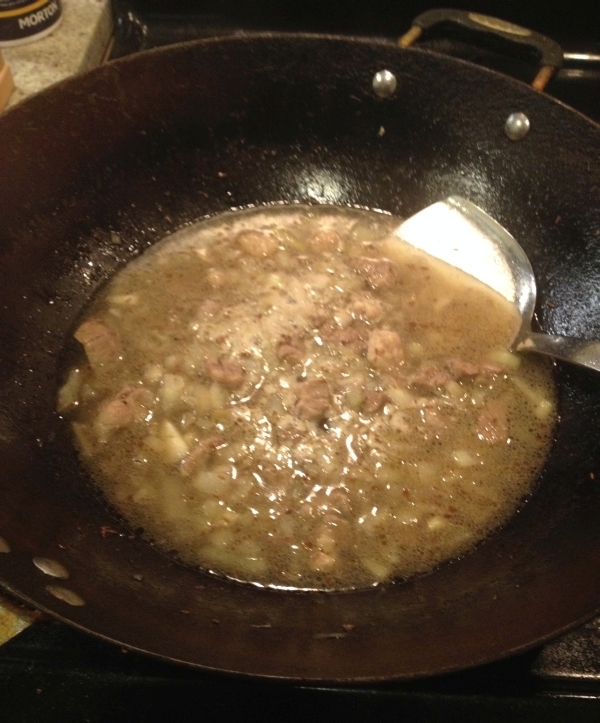 Traditionally, the meat is boiled (I sautee it then simmer) and there are no vegetables other than onion. I was inspired by this Uyghur video which is actually for a different dish entirely. Stalic has a video for beshbarmak, as does Abdulaziz Salavat (both videos in Russian). The Russian Wikipedia article for Beshbarmak has everything you would want to know about its etymology and its different national variants. 1. Make a dough out of flour, egg, salt, water, and a bit of oil. Knead for 10 minutes and set aside, covered. Let it rest for at least half an hour. 2. 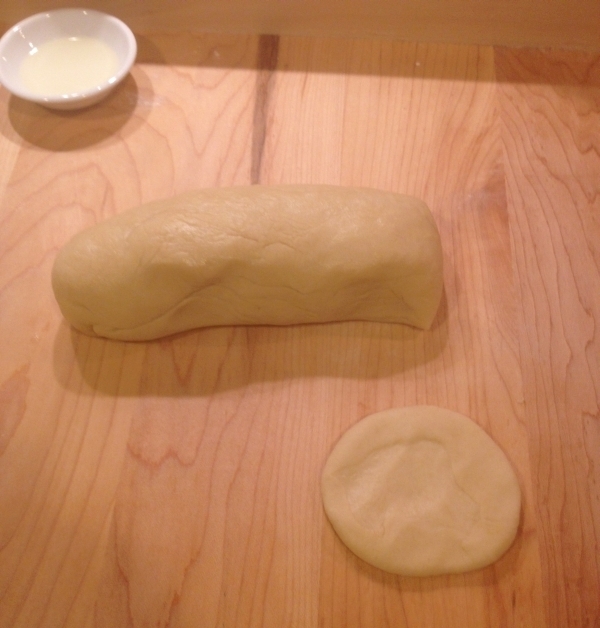 Roll the dough into a cylinder and use a knife to cut off a small piece. Lightly oil the piece. 3. 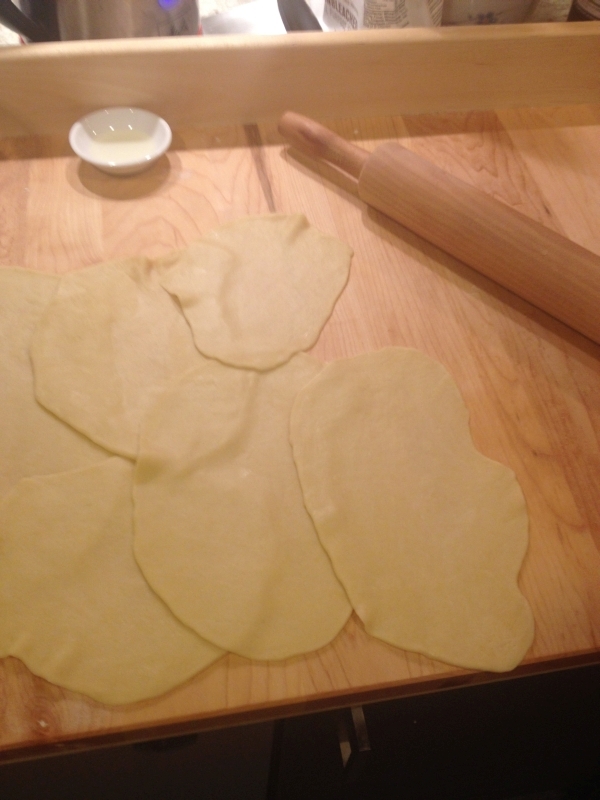 Use a rolling pin to flatten out the piece into a big, thin, pasta sheet. Continue until you’ve used all the dough. Make sure to space out the pieces so they don’t stick together. 4. Bring some water to a rolling boil, lightly salt, and put in the beshbarmak pieces one by one. After the water has returned to a rolling boil, let it cook for another 1-2 minutes. Be careful not to overcook the noodles – you want them al dente. 5. Drain the noodles and rinse them with cold water. 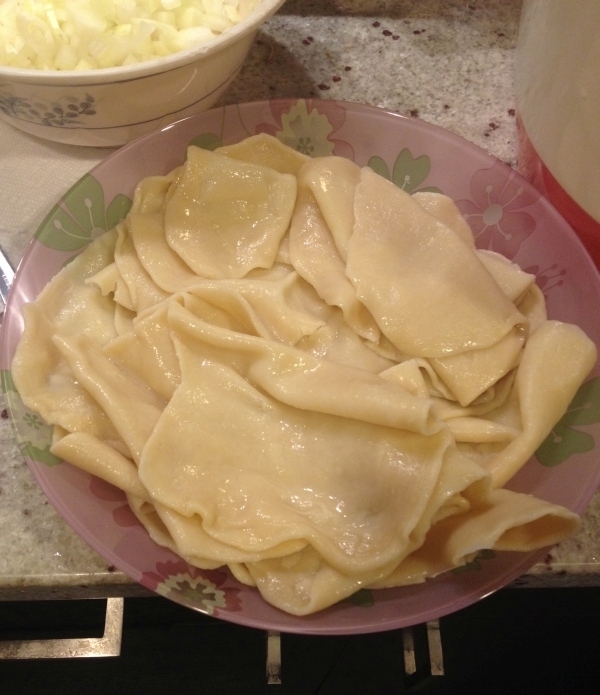 Layer the noodles in a plate. 1. 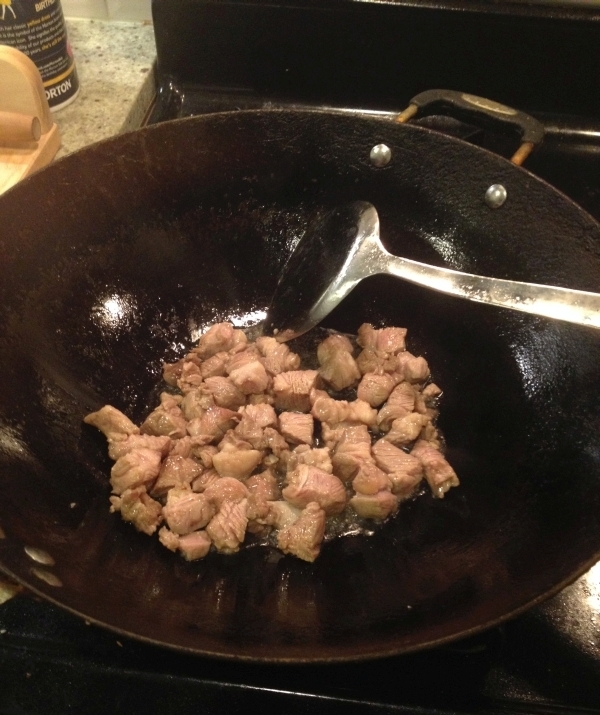 Sautee the lamb meat in oil over medium-high heat until browned. 2. Add in the onions and cook until soft and translucent. 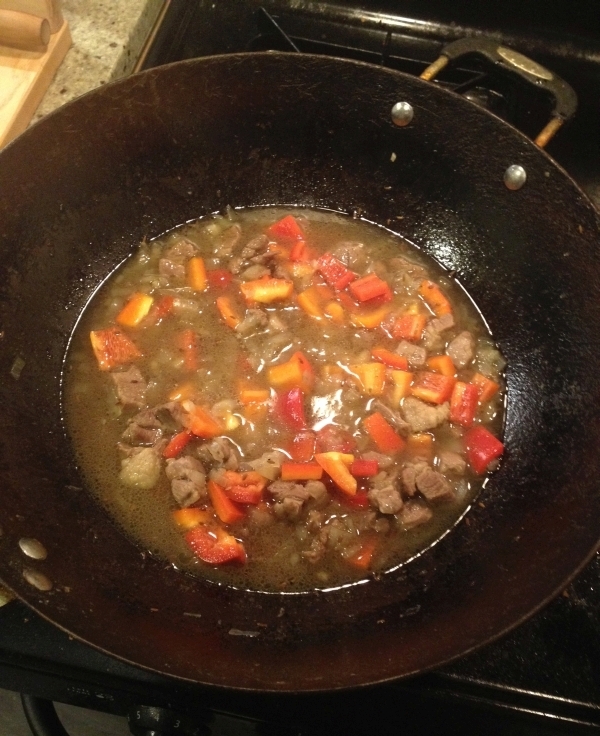 Add salt, cumin seeds, and white or black pepper. Mix well. 3. Add bouillon/water until the contents are barely covered. 4. When it starts to boil, turn the heat to low and cover. Cook for at least 30 minutes. 5. Open the lid and add in the bell pepper. Cook this briefly over medium heat. 6. 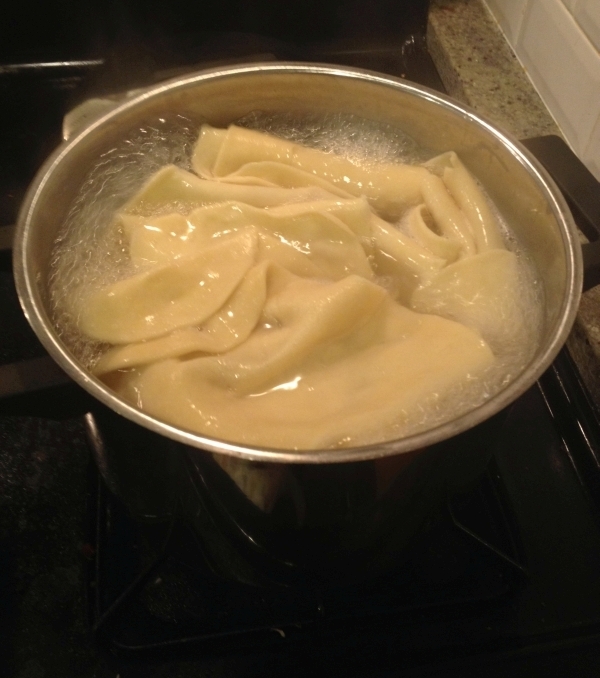 Pour some hot broth over the noodles to warm them up. Put the topping on the noodles. Ash bolsun!